Scott #'s C99 & C100. Scott #'s 1832 & 946. Scott #'s 1890, 1891 & 1893. Scott #'s 1939 & 1940. Scott # 2015. Signed By Daniel Boorstin Librarian Of Congress. Scott # 2017, 956 & 1099. Scott #'s 2037 & 933. Scott # 2178 w/ 1022. Scott #'s 2168 w/ 1408. Scott #'s 2170 w/ 2087. Scott #'s 2172 w/ 991. Scott #'s 2167 w/ 782. 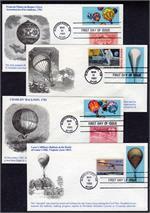 Scott #'s 2176 w/ 1116. Scott 2286-2335. 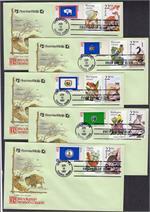 Combination with State Birds & Flowers stamps.